Sonam Lhatso, a nun from Kardze County, Sichuan province, is serving a 10-year prison sentence after she took part in a protest against patriotic education sessions and forced denunciation of the Dalai Lama, on 14th May 2008. She was arrested along with 50 fellow nuns from Pangri Nunnery and was subjected to beatings. According to some sources, she might be held in Mianyang Prison, Sichuan Province. The authorities have refused to confirm this, or provide any details about her wellbeing, despite appeals from her fellow nuns. Sonam Lhatso is part of Free Tibet's In The Dark campaign, which aims to find disappeared Tibetans and work for their release. We are working on the cases of eight political prisoners held by the Chinese authorities, all of whom remain cut off from the world with little or no information about their location or current condition. Urge China to release them and respect human rights! 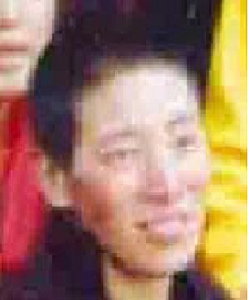 We are contacting you to raise the case of Sonam Lhatso (索郎拉措, Suolang Lacuo), a Tibetan nun who is currently serving a 10-year prison sentence in an undisclosed location. We urge you to work towards her prompt and unconditional release. Sonam Lhatso is a nun from Pangri Monastery in Ganzi Tibetan Autonomous Prefecture. She was arrested in May 2008 after participating in a peaceful demonstration by a group of nuns in response to a military crackdown and political re-education campaign in Kardze County. Several of the protesters were beaten during her arrest. Sonam Lhatso has committed no internationally-recognised crime. Her arrest, detention and conviction appear to be in response to her peacefully exercising her rights to freedom of assembly and freedom of expression. As you know, Article 35 of the Chinese constitution guarantees freedom of speech, freedom of assembly and freedom of demonstration for all citizens. Although we believe that Sonam Lhatso may be being held in Mianyang Prison, this has not been officially confirmed, and the local authorities in Kardze County have refused to divulge any information about Sonam Lhatso’s whereabouts or condition to her the residents of Pangri Nunnery, despite numerous appeals. The lack of information about Sonam Lhatso’s status raises concerns that she could be subject to torture or other forms of ill-treatment. Refusing to divulge her location and cutting off access to visitors could also prevent her from receiving any medical treatment that she may require.